So, let's go for a walk-through of the Bauhaus experience. First of all, it was a nice bit of respite going downstairs into the warm, cozy atmosphere of the café. A true sanctuary from the cold Korean winter! As soon as you enter Bauhaus, a host or hostess will show you to a table, take your drink order and hand you a menu. The menu has pictures of all the dogs that are currently available, and for what I think are obvious reasons, the menu gets updated daily. Patrons don't have to choose from the menu, however. The dogs are actually running around a common area between all of the tables, so if you choose, you can select a dog by sight rather than selecting its picture from the menu. I think the appeal of being able to select a dog on the spot is that you can see the behaviour of the dog, which changes the characteristics of the meat. The energetic dogs generally have more adrenaline in the blood which is thought to be an aphrodisiac and increase virility, whereas other less-active dogs may be more marbled. What I thought was interesting is that the dogs seemed unfazed and not at all demoralized by the situation unfolding around them. 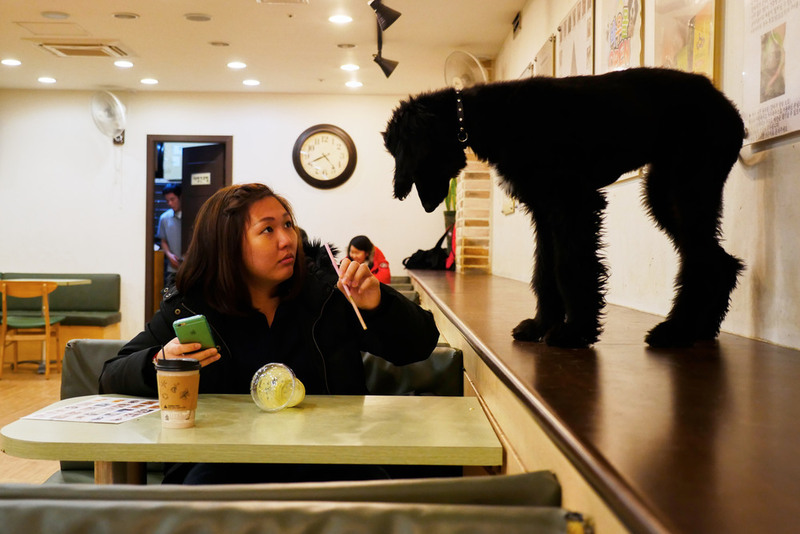 After careful selection, the customers will communicate their choice to the server and another member of the staff will round up the dog and prepare it. A short while later, the raw meat will be brought out to the table to be cooked to taste by the customers. All in all, a unique experience that sure wasn't something I thought I would ever get to do. Definitely worth checking out if you find yourself in the Hongdae district in Seoul, I would certainly recommend checking this place out! FUN FACT: While there is a very small percentage of Koreans who eat farmed dog meat regularly, there is a large and vocal group of Korean people against the practice. On the whole, the consumption of dog meat in Korea is on the decline, particularly with the younger generations which may be related to the increase in popularity of having dogs as household pets in the country.